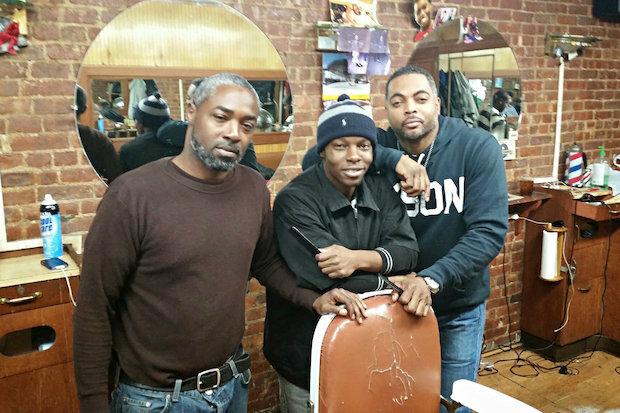 BEDFORD-STUYVESANT — A famed local barbershop that counted Notorious B.I.G. among its stylish clients performed its last shape-up on New Year's Eve. Head Hunter Barbershop, which served generations in Bedford-Stuyvesant for nearly 70 years, shut its doors for the final time on Dec. 31. Due to an increase in rent and gentrification of the neighborhood, owner Mark Johnson started 2015 by clearing out the vintage barber chairs and taking down framed photos, awards and trinkets from the shop’s brick walls. “It was an extremely, extremely hard decision and I fought with it for more than a year now,” said Johnson, who owned the shop for 22 years. “I tried to negotiate with the landlord down to the wire. The African-American owned business at 1092 Bedford Ave. opened in 1947 and acted not only as a spot to get a good shape-up, but also as a place for the community to gather. Employees and customers engaged in playful banter, debated everything from current events and politics to relationships, and bonded over card games and chess. The shop was frequented by rapper Notorious B.I.G. and DJ 50 Grand, who helped bring the artist to fame, according to customers. Johnson, who started cutting hair in his East New York bedroom at 19, took over Head Hunter when he was 23 years old, after former owner Kevin Newsome passed away in 1996. Working alongside barbers Bobby "Boo" Smith, Laurent "L" Aladin and Daequan Halsey, Johnson said he taught life lessons in the shop, showed young customers that “it was OK to wear a suit” and exposed them to old jazz, R&B and classical music. “You got a $15 haircut and a shave, but you got so much more that was for free," Johnson said. "Psychiatry, fashion coaches, life coaches — I learned so much from so many people coming in that I just paid it forward." Head Hunter drew a loyal following, with older clients bringing in their grandchildren for their first haircuts to continue the legacy, customers said. There was standing-room only in the shop on Head Hunter’s last day, which was "very trying and emotionally exhausting,” according to Johnson. Jason Minnis, 33, received his last haircut from Head Hunter on Dec. 31 and stayed for more than four hours as a final goodbye. He had been getting cuts at the shop for the last 10 years. “It felt like a wake," Minnis said. "Everyone tried to keep a brave face… I actually had to leave because I got a little emotional. “When I moved here from down south as a 23-year-old kid, the cats at Head Hunter showed me love. That's like my home," Minnis said.